So we’re delving back into T-Spine territory again after sharing a drill I’ve incorporated in my clients’ warm-ups. 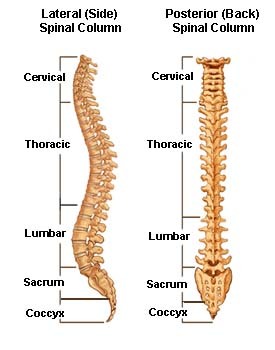 First, “t-spine” is short for thoracic spine. Please, if you want your body to be a lean, mean, elite athlete machine, learn a bit about it. Usually its about looking out for your low back or your neck, or your shoulder, or your knee, but never t-spine…at least not yet! It is still important however because it is in between your low back and neck. And since everything in your body is connected, it exists in a functional interplay with these objects. Something out of whack with your low back or neck? You got it, the t-spine will have a resulting shift in stress as well. Your scapular (shoulder blade) mechanics are altered in this posture since the shoulder blades cannot lie flat against the ribcage,and so they’re in a bit of anterior tilt. Well now your acromion is depressed, and so there is increased likelihood that as you lift your arm up overhead/go into shoulder hyperflexion or abduction, your humerus is smashing up against Mr. acromion, and its a party that could lead to having pain. Pain that affects your training and athletic endeavours. Pretty healthy cascade of events right? But in all seriousness, this isn’t just to get you down about spending too much time on Facebook . The message is simply to take care of your business. If you know you sit at a desk all day at work or school, then do your t-spine and the rest of your body some favours when you train, by giving it the movement it should have but may not get in those societally-influenced environments. Another factoid: We all have some level of dysfunction going on, the key is to keep it from becoming symptomatic i.e. painful. Particularly if you want your body to throw 90 mph fastballs or hit 400-foot bombs. That’s a ton of force to produce through your body…its also a ton of stress on it. Take responsibility and reduce your risk of injury. Movement-wise what can we take from our beloved computer guy above, and make into good training information? Well, we can see he’s rounded through the upper back, called kyphosis. If you’re this flexed, you gotta get working on your extension. Grab a foam roller, set it at the base of your ribcage, extend over it a couple times, move the roller a quarter roll up your back, and repeat until you reach your shoulder blades. If its also this flexed, rotating it usually isn’t so hot either, so that’s a focus too. The drill from Friday is great for this. * – Much like Red Bull does not actually give you wings, doing t-spine drills does not actually make you bulletproof. Don’t try to be a hero.